If you navigate to reviews within Google Maps and try to click on the "next" button to see more reviews for that Google Maps/Places listing, it might not work for you. 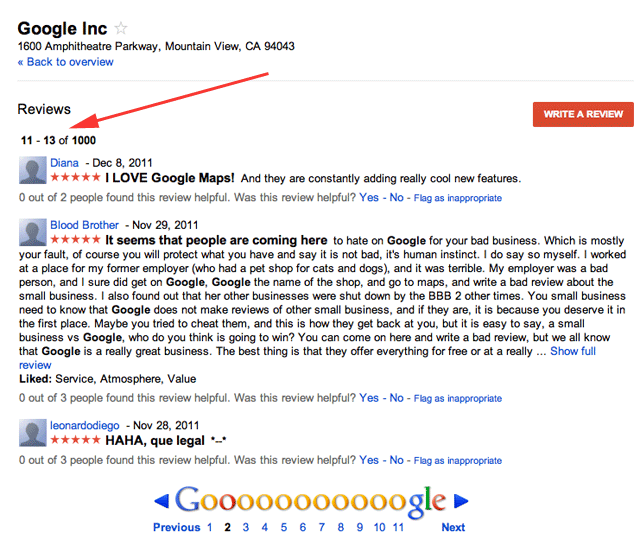 Try going to Google's reviews on Google Maps and clicking on the next button. It will only show you up to 13 of the 1,000+ reviews. Try clicking on the next button and it won't take you far. This is not just a bug with Google's specific reviews, it seems like it is a bug with any company with over 15 or so reviews. See the Facebook Google Maps reviews and it will have the same issue. Team's working on a fix right now. I'll keep you posted once we've got it sorted. Thanks for the report!